I really like AHAs. I find that they are great for mild exfoliation, non-drying, and helps to lighten my hyperpigmentation left from blemishes. 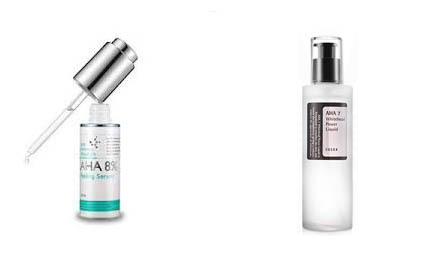 AHAs help to loosen up the top layer of your skin to leave expose the softer skin underneath. You must use sunscreen in conjunction with AHA as your skin will become more sensitive. AHAs are actives, you really need to be vigilant in patch testing and building up your tolerance before you start using them daily. My first foray into AHAs was through Mizon. After using three bottles, I decided to move onto Cosrx and am currently more than halfway through my second bottle (they come with stickers and extra samples!). Although both products use glycolic acid in its base, I have noticed some differences between how I use them and their effects. In this post, I will talk about some of the differences I've experienced with each. Which do I like better? I like both for different reasons. I like Mizon because it is of a stronger concentration and I enjoy using the serum texture. It is easier to see results, but it also can cause stinging and I've seen it cause more CCs on my face than Cosrx. On the converse, I like Cosrx because it is better value for money and the watery texture makes it easier for me to use on the back of my legs or other places I need exfoliating. It rarely, if ever, causes my face to sting. It takes more time to see results, but you can use it everyday. For beginners, I would recommend Cosrx as it is not as concentrated. For people who already have a good tolerance for AHA and would like to see faster results, I would recommend Mizon.